Let’s clear up one small detail before we discuss mantel clocks. Which spelling is correct: mantel clocks or mantle clocks? A quick Internet search retrieves thousands of references to both terms. However, the correct spelling is indeed mantel. According to the dictionary, the primary meaning of mantle is a loose fitting sleeveless outer garment, something like a cape. A mantel, on the other hand, is the ornamentation around a fireplace that includes the shelf. In the days when the average home didn’t have much in the way of furniture but every home had a fireplace for heating and cooking, the mantel became the place where a clock was placed; hence the name mantel clock was used. But American English is changing so look under both spellings if you are searching online for information! The earliest mechanical clocks made in the 1300’s were large and cumbersome timekeeping devices. By the late 1500’s in Europe, royal houses employed court clockmakers to fashion elaborate clocks for their great palaces. Clock technology had improved sufficiently that table clocks became popular, where the clock was placed on a sturdy table both for support and to showcase the fine artwork. While these clocks did not keep good time, the table clocks that were made for royalty at the end of the sixteenth century were impressive works of art that took center stage on a large table. These clocks were frequently made from brass and featured great embellishments and detailing. Besides keeping time automaton clocks included complex mechanisms for striking bells and musical chimes as well as moving figurines. Meanwhile, English clockmakers were lagging behind their continental counterparts in technology. 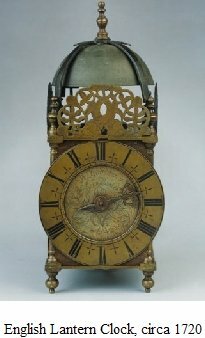 However, in the early 1600’s the lantern clock was the standard table clock in England. In England, bracket clocks became popular in the 1600’s as well. In addition to brass clock cases, wooden cases were gaining in favor. Both lantern clocks and bracket clocks are also called early mantel clocks. Bracket clocks remain a traditional style of table clocks and bracket clocks with electronic or key wind mechanisms are manufactured even today. 1. The pendulum was applied to clocks in 1657. 2. The anchor escapement was developed in 1671. 3. The invention of the rack and snail striking method in 1676 advanced the technology of repeating clocks. 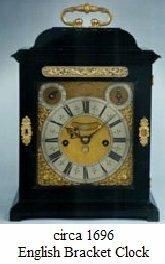 The style in table clocks remained approximately the same throughout the 1700’s in England with lantern and bracket clocks continuing to be the norm. About the only deviations in style were variations in the dials and some models were made with a rounded instead of a flat top. The earliest American shelf clocks were cumbersome devices, especially the ogee clocks with their large weights. However, once spring driven clocks were manufactured in the United States, the major American clock companies turned out mantel clocks by the tens of thousands for the domestic market as well as for export to numerous countries around the world. While there were lots of other styles of shelf clocks, a staple of American production from the 1850’s to the 1920’s was the black mantel. They typically had a size of about 12 inches high, 16 inches wide and 7 inches deep. Many of the clock cases were made of wood and painted with the glossy black enamel paint according a process invented and patented by Edward Ingraham. The dial was centered in the clock case and most black mantel clocks had two key wind openings, one for the time and one for strike. Stylistically, many black mantels had one or more celluloid columns on both sides of the dial. The top of the case was either flat or curved. Many of these mantel clocks stood on cast pot metal feet that were coated with brass colored finish. Frequently these clocks also had painted gilt filigree decoration on the front of the case. 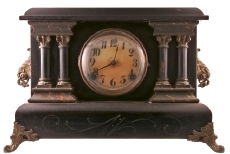 There are literally hundreds of variations on the black mantel clock as produced by the major American clock companies. If you are a novice clock collector or are just becoming interested in American clocks and their history , you can’t go wrong with acquiring a black mantel as one of your first clocks. It is easy to find one in good condition for a fair price. Should the mechanism not be in perfect running order, a reputable clock repair shop can fix or replace the works with ease. One of the best methods for finding just the right clock is to check out eBay. They have thousands of clocks displayed at any one time; many more than you could find in stores. It's easy to register if you haven't already.